Our enemies have identified our Achilles’ heel. It’s infuriating, but we may as well admit it: they have figured us out and know how to get results. They’ve learned that if you want to extort something from Israel, the way to do it is to kidnap our people and hold them hostage. This isn’t a new revelation– they’ve already used this tactic to free 1000 terrorists in exchange for Gilad Schalit in 2011, leveraging experience they had gained after previous kidnappings, like the deal for Ehud Goldwasser and Eldad Regev in 2008. Undoubtedly, that’s the thinking behind the current kidnappings also. Let’s be honest. Even after the worst terrorist attacks, including the mass suicide bombings of the early 2000’s, within a few days after the attack, we’ve all moved on emotionally. Of course we are devastated, saddened, and enraged, and we will never forget the victims, but on the day-to-day level we move on. We have no choice – if we allowed terrorism to break us, we’d have been defeated long ago. But when there are hostages, it’s different. As long as we believe there’s even the slightest chance they are alive, we just can’t let go. We worry endlessly about them and their welfare, exactly as if they were our own family members. And most importantly, we are willing to do just about anything to bring them home. We pray that this time it will be the IDF that gets our boys back safely. But ultimately, if it were to become necessary we might well agree to pay an absurdly high price again, just like we did for Gilad Schalit. There were agonizing debates about the exchange back then, and they’ve become wrenchingly relevant again; yesterday the army announced that one of those released terrorists was indicted for the murder of Baruch Mizrahi right before Passover. (Personally, as I wrote at the time I was very torn, and remain so now). So they’ve found our weakness. What they don’t realize is that they have also revealed our greatest strength. On the Sunday night following the kidnapping, there was a mass prayer at the Western Wall, with an estimated 30,000 people. I was in the Old City that day, as my wife’s cousin was visiting Israel with her family, and I gave them a tour of the area. It was their first trip to Israel ever, and they joined us at the prayer gathering. Seeing the event through their eyes was amazing. Watching endless waves of people enter the Kotel plaza, they kept asking: Are all of these people really coming for three boys that almost none of them know? Are you sure this was only announced a few hours ago? A teenager had recently been murdered in their hometown of Portland, OR, and the contrast in the public reactions was remarkable. And it doesn’t stop. I don’t think I’ve been to a single prayer service in the past two weeks without an extra chapter of psalms being added. I had the pleasure of attending two students’ weddings in the past two days, and both said a special prayer under the chuppah. A few days ago the electronic siddur on my Android phone (Tfilon – highly recommended and free!) 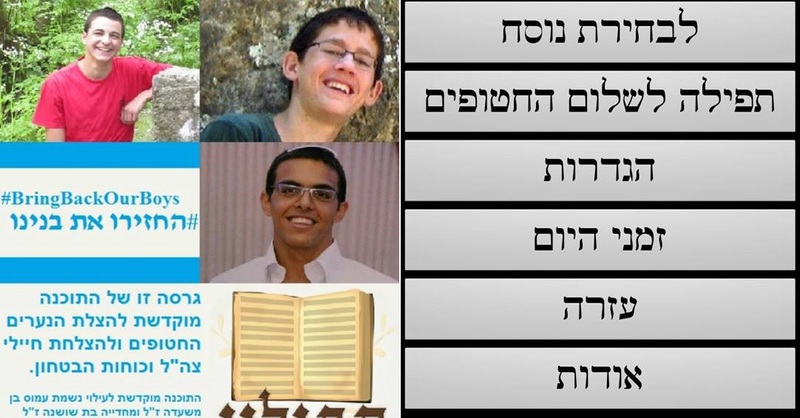 was automatically updated to include a prayer for the three boys’ release. And it’s not only the Orthodox. Many secular Jews have joined in as well, including talk-show hosts Avri Gilad and Hila Korah who recited psalms on their show as an expression of unity. A special Mincha prayer was held in the Knesset this week, and Finance Minister Yair Lapid reported that he prayed for the first time in six years upon hearing of the kidnappings. 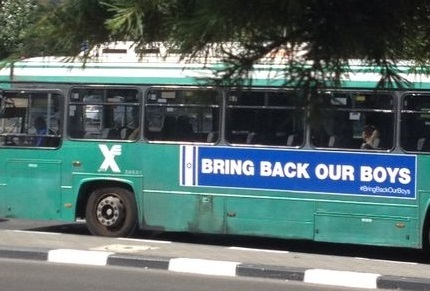 And of course there was the instantly-viral #BringBackOurBoys internet campaign that continues to gather steam from all over the world. Indeed, no other nation could show this type of unity. It may be our greatest weakness but it is also our greatest strength. It’s sad that it sometimes takes tragedies to bring it out, but we must learn from this. We pray that our boys – our boys – come home immediately and this tragic affair comes to a speedy end. But then we have to make sure not to lose this. This entry was posted in Uncategorized on June 24, 2014 by rabbihaber.